The protesters currently worrying African governments so are much braver than I am, and a lot noisier, and sadly are failing to aim straight - but they have achieved a great deal, so I admire them. They persist, and so far have got much of what they demanded; not a zero government (that's the poor targeting) but a different government, and hopefully a better one. At this writing Qaddafi hasn't quit Libya, but Mubarak left Egypt a day after swearing he wouldn't, but couple of hours after I uploaded Mubaraktomy? (see how influential we're becoming!) while Ben Ali fled Tunisia a full five weeks ago. In Côte d'Ivoire Laurent Gbagbo is still being a spoiled brat after losing an election, and as we know other governments across the region are trembling. This all sets a splendid precedent from which we can learn. Why do some go and some stay, and what can we learn so as the sooner to bring about a zero government society? The pattern is very clear: it all comes down to support. If the key enforcers of a ruler's rule continue to kill dissidents (Gbagbo, and Qaddafi so far) he gets to keep his fancy palace, but if such armies say it's time to go (Ben Ali, Mubarak) he goes. The qualities of the governor are of only secondary importance; what counts is whether or not his orders are obeyed. De la Boëtie was exactly right: "I do not ask that you place hands upon the tyrant to topple him over, but simply that you support him no longer; then you will behold him, like a great Colossus whose pedestal has been pulled away, fall of his own weight and break in pieces." 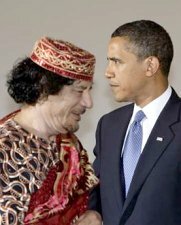 The Qaddafi example is interesting; the man (on the left, in the photo) is obviously pathetic, probably insane, and already two of his air force pilots have taken their fighters to Malta, his UN delegation has deserted him and half his country is in dissident hands. His son and heir Saif al-Islam does at least look properly dressed, but his words reveal him too as a sociopath and megalomaniac; he promises rivers of blood unless the uprising ends. Other people's blood, that is, not his own; and plenty has already flowed. When the wizard's curtain is drawn back, these "strong men" are revealed for the frauds they are and always were, stunted, murderous human beings intoxicated on power. Yet Europe depends on this idiot for a majority of its vital supply of oil. He will leave when, but only when, his well armed groupies desert him. In the context of our own plans for a zero government America, as each person gets to understand what freedom means and what government really is (that's all government, not just the ones run by recognized tyrants) he will amplify this African precedent by resolving never to work for one. Knowing not just that all government creates massive mayhem (that's the utilitarian argument) but also that in essence it is fundamentally evil and anti-human (that's the moral imperative) such a decision will be easy to make. Each needs only to do one other thing - to bring one of his friends each year to do the same. A very simple, lightweight task. Then government will inexorably lose employees at an increasing rate, until finally even its armed protectors walk off the job in disgust, like those Libyan pilots. When that job is done, it will stay done. That's because every member of our zero government society (unfortunately, unlike the present protesters on evening TV) will understand and desire it.